Last month both my new books on the topic of the unborn (human embryos and foetuses) were published. 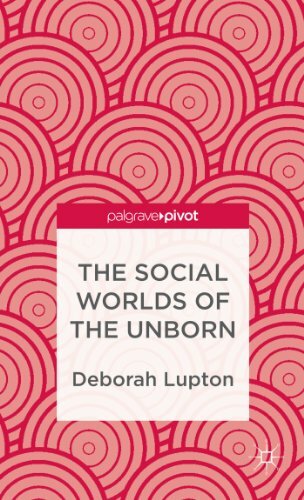 One is an authored book, part of the Palgrave Pivot series, entitled The Social Worlds of the Unborn. The other, The Unborn Human, is an open access book that I edited as part of the Living Books about Life series published by the Open Humanities Press. Both books deal with very similar issues and theoretical perspectives, and therefore complement each other nicely. The Social Worlds of the Unborn has five substantive chapters. The first chapter examines what I call ‘contingencies of the unborn’, drawing on sociological, anthropological, bioethical, philosophical and historical perspectives to highlight the dynamic nature of the ways we think about foetuses and embryos and the debates over the extent of their humanness and personhood. I then go on in the next chapter to discuss technologies for visualising the unborn, such as foetal photography and computer imaging and obstetric ultrasound. These have been particularly important technologies in opening up the uterus to the gaze so that we can see the previously mysterious entities that inhabit this space. I argue that visualising technologies have worked to represent unborn entities as already persons in their own right, autonomous from the maternal body, and indeed as already infants. These images also represent the unborn as beautiful, fragile and vulnerable entities requiring our utmost love and protection, and thus are powerful agents in anti-abortion politics. In the third chapter of this book I focus on pregnant women’s perspectives on the unborn entities growing within their own bodies. I highlight the ambivalence that pregnant women often feel about this Other body inhabiting their own, as well as their difficulty in coming to terms with their ‘two-in-one’ bodies that depart so radically from the contained, unitary bodily norm. The concept of the ‘good mother’ often precludes acknowledgement that pregnant women may sometimes feel as if their unborn is antagonistic and even parasitic. Yet these feelings are not uncommon in pregnant women, in addition to the more culturally accepted notions of the unborn as precious proto-infants. The next chapter goes on to examine the dead unborn, including discussion of abortion practices, policies and politics, decisions about the disposal of surplus IVF embryos and the mourning and memorialisation of unborn entities lost in miscarriage or stillbirth. It also looks at bioscientific definitions of the unborn and how working practices in the medical clinic or stem cell laboratory operate to deal with using matter from dead unborn entities. Here again issues concerning judgements about the humanness and status of personhood of various unborn entities are to the fore. I demonstrated that the context in which these entities are created and grow (or fail to develop) is vital to concepts of their value and vitality. The final substantive chapter examines the concept of the endangered unborn, particularly in relation to how pregnant women are represented as posing a threat to their unborn through ignorance or deliberate negligence. I argue that the increasing humanisation and personalising of the unborn and their representation as precious, vulnerable and as already infants with full human privileges work to position them as more important than the women who bear them, who increasingly as positioned as vessels rather than as individuals with their own rights and needs that may differ from those of their unborn. The edited book, The Unborn Human, takes up many of these issues. I review the contents of the book in my Introduction (‘Conceptualising and configuring the unborn human‘), showing how each item in the collection contributes to various ways of thinking about, treating, representing, creating or destroying unborn entities. 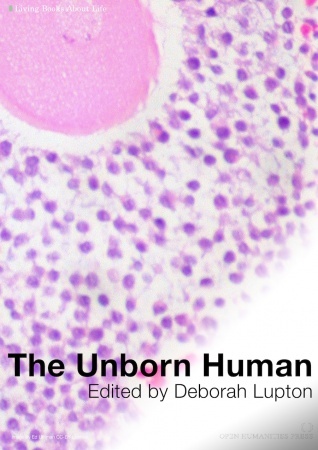 Like the other books in the Living Books about Life series, The Unborn Human is a curated collection of material that is available as open access publications. Some of this material can be viewed via links to the website embedded in the book, while others can be directly accessed under the Creative Commons Attribution licence. This means that all of the articles and other materials included in the book, which range from historical documents to scientific, medical, bioethical, policy, sociological, anthropological and cultural studies articles as well as social and other digital media material such as websites, blog posts and YouTube videos, can be accessed for free (including my introduction using the link supplied above). I have published several posts on this blog now about mHealth and the quantified self (see them here). I have also written two scholarly publications that have been published in academic journals discussing this topic in greater depth. In the first article I looked at how theories of surveillance society and the cyborg body could be applied to understanding the use of digital health technologies as they are used for health promotion, and also discussed privacy, intimacy and ethical issues (see here for details of the first article, the full version of which is open access). Mobile and wearable digital devices and related Web 2.0 apps and social media tools offer new ways of monitoring, measuring and representing the human body. They are capable of producing detailed biometric data that may be collected by individuals and then shared with others. Health promoters, like many medical and public health professionals, have been eager to seize the opportunities they perceive for using what have been dubbed ‘mHealth’ (‘mobile health’) technologies to promote the public’s health. These technologies are also increasingly used by lay people outside the professional sphere of health promotion as part of voluntary self-tracking strategies (referred to by some as ‘the quantified self’). In response to the overwhelmingly positive approach evident in the health promotion and self-tracking literature, this article adopts a critical sociological perspective to identify some of the social and cultural meanings of self-tracking practices via digital devices. Following an overview of the technologies currently available for such purposes I move on to discuss how they may contribute to concepts of health, embodiment and identity. The discussion focuses particularly on how these technologies promote techno-utopian, enhancement and healthist discourses and the privileging of the visual and the metric in representing the body via these devices. My current research is moving from a focus on health promotion to the construction of patienthood in digital health discourses. I’m looking at how patients are being encouraged to engage in self-monitoring and self-care activities to reduce healthcare costs, and the commodification of patients’ accounts of their experiences of illness and healthcare on social media platforms designed to elicit patient opinion. For some years now, obesity sceptics have argued against the mainstream medical and public health perspective on obesity. Writers such as Paul Campos (2004), Michael Gard and Jan Wright (Gard and Wright, 2005; Gard, 2011) have published closely argued critiques of the obesity science literature. They persuasively identify the many inaccuracies, distortions, misleading assumptions and generalisations made in scientific and epidemiological research which have contributed to the idea that obesity is at ‘crisis’ or ‘epidemic’ levels and that being over the arbitrarily defined ‘normal’ BMI automatically damages people’s health. It is not the case that there are far greater numbers of fat people now compared to several decades ago. While there has been a modest increase in average weight, this does not represent an ‘epidemic of obesity’. Life expectancy in western countries has risen, not fallen, despite alleged growing rates of obesity and the supposed life-threatening health conditions caused by obesity. There is no statistical evidence that being fat necessarily equates to a greater risk of ill health or disease. Statistics show that only those people at the extreme end of the weight spectrum (the ‘morbidly obese’ in medical terminology) demonstrate negative health effects from their weight. The data show that higher body weight may even be protective of health in older people. The epidemiological literature has been unable to demonstrate that significant weight loss improves fat people’s health status. Indeed continual attempts by fat people to lose weight can actually be negative to their health status if it involves extreme diets, being caught in a cycle of losing and gaining weight or poor dietary habits. Fatness is often a symptom rather than the cause of ill health and disease. There is no consensus from the scientific literature that people in contemporary western societies are less active now than in previous eras: indeed many people, particularly those from the middle-class, are highly physically active. No clear association has been found between activity levels and childhood overweight and obesity, or between children’s television watching habits and their body weight. Nor have studies conclusively demonstrated that relative levels of physical activity influence health status. Medical research has not been able to show how much exercise should be undertaken and how often to achieve and maintain good health and which diseases are affected or prevented by taking regular exercise. It is also very difficult to demonstrate scientifically the relative influence of genes in body weight. In all these areas there are many contradictory and conflicting findings from research studies, making it difficult to anyone to make confident statements about these issues. As these obesity sceptics point out, many of the generalisations made by obesity scientists and public health experts simply disregard the lack of consistent, clear or conclusive evidence for such statements as ‘obesity is caused by lack of exercise and eating too much’ and continue to reiterate these assertions. What obesity sceptics present, in essence, is a detailed critique of the ways in which political agendas and pre-existing assumptions shape the reporting and interpretation of medical and epidemiological data relating to body mass. Quite apart of its relevance to debate about whether the obesity epidemic exists and how serious it is, such an analysis is valuable in drawing attention to the work practices and knowledge claims of medical and public health researchers. The assertions and critiques of obesity sceptics have failed to make an impact on mainstream obesity science, government health policy and anti-obesity public health efforts. Journal articles concerning the dangers of obesity continue to appear in medical and public health journals with monotonous frequency. Alarmist predictions continue to receive attention in the mass media. Governments in western countries have also continued to invest large sums to fund health promotion campaigns seeking to counter obesity. For example, the American ‘Let’s Move’ campaign, directed at controlling childhood obesity, was launched by First Lady Michelle Obama in early 2010, while on the same day President Obama created a Taskforce on Childhood Obesity. The Australian ‘Swap It, Don’t Swap It’ anti-obesity campaign commenced in early 2011. It would seem that there are powerful political and career investments in continuing to ignore the arguments of the obesity sceptics. Campos, P. (2004) The Obesity Myth. New York: Gotham Books. Gard, M. and Wright, J. (2005) The Obesity Epidemic. London: Routledge. 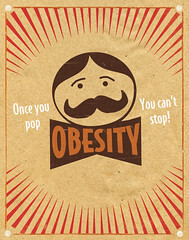 Gard, M. (2011) The End of the Obesity Epidemic. London: Routledge.